NEW FFS PRO E-Forms Available for Download! 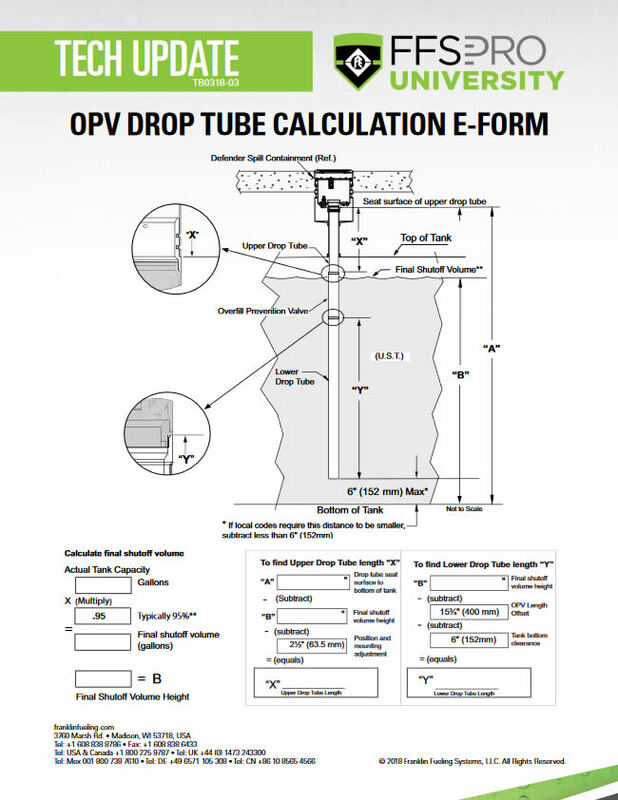 Franklin Fueling Systems has a new interactive and electronic version of the Defender Series® Overfill Prevention Valve Installation Worksheet that you can download here. This worksheet can be downloaded and completed by typing values and calculations directly into the form. It does not automatically perform the calculations but does provide typical values in some of the fields that can be adjusted in accordance with local regulations. You can then save the completed worksheet as a digital file or print it out for a clean and legible worksheet. There is also a step-by-step inspection guide and checklist. 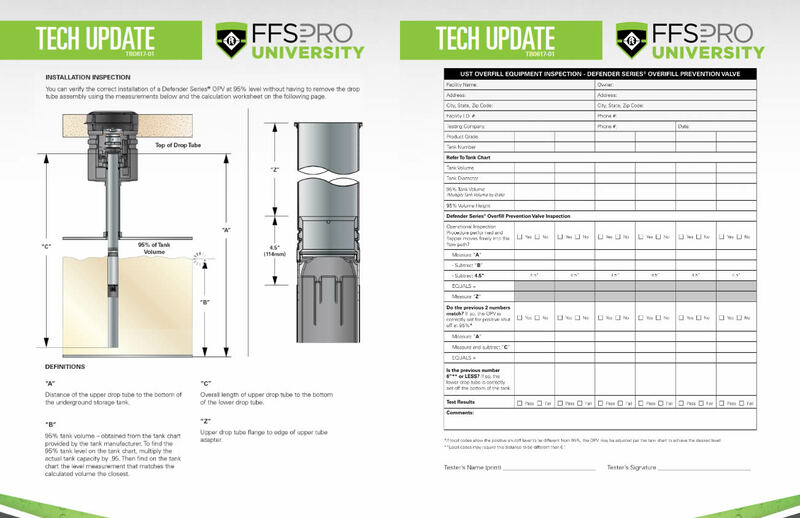 The Defender Series® Overfill Prevention Valve allows inspection without removal from the tank as explained in the Tech Update you can download here. Like the calculation worksheet, you can enter all the information directly into the form on the screen then print or save the file digitally. Again, it will not automatically perform the required calculations necessary to complete the form. Defender Series® Overfill Prevention Valve : You will find the most common configuration on our site with others available. You can see a complete list of the current available choices here. Franklin Fueling Systems provides you with the technical information you need to be efficient and accurate in the office or out in the field. Be sure to visit the FFS PRO Univeristy Campus online today for more technical news, tips and tricks! Please feel free to contact us at 1.800.238.1225 with any further questions about the Defender Series® overfill protection valves, Franklin Fueling System products or any other refueling equipment questions or needs you currently have.